The sun is shining and the weather is sweet, at least for today. The sun gives us energy to run our computer and acoustic devices. Since the acoustics get priority over the computer, we have had to wait a couple weeks for a good sunny day to fully charge our computer, thus post a blog. It keeps us in our toes! The past few weeks have been spectacular. 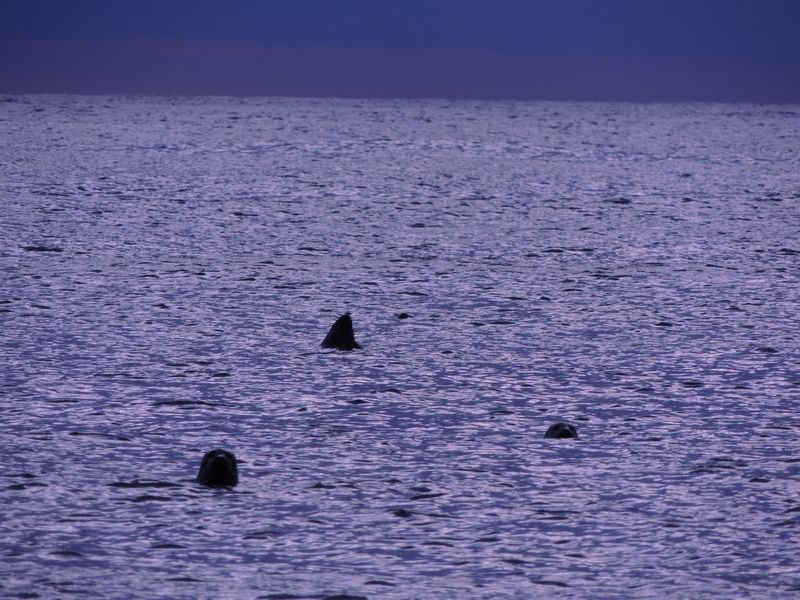 Only a few days ago, we had some surprise visitors to our banding site: 300 harbor seals! All of which were searching for food, floating around, and calling to each other. We are so lucky to be living on such an amazing island, seeing some beautiful scenery and working with some really cool birds. We have gone on epic adventures exploring the island and we have holed up in our sleeping bags eating PB&Js and reading novels from action adventure, to fantasy, to hiking the Appalachian Trail and more. Of course we are also working, trying to catch as many birds as we can. 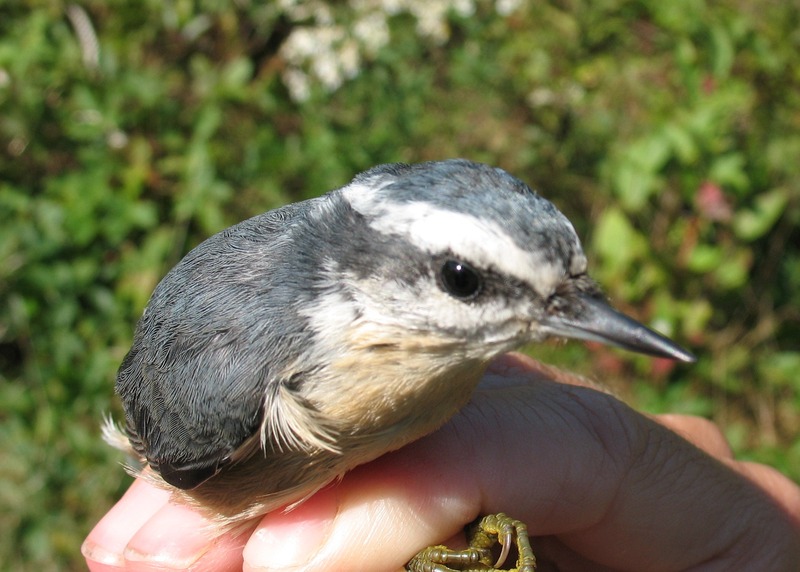 To date we have caught over 450 birds in 32 banding days. That’s pretty good considering we are only running 14 nets and many days we have to close early because of wind and or rain. Over the past couple weeks we have been getting some late warbler migrants consisting mostly of Blackpoll Warblers (BLPW). Since we have been seeing so many BLPWs we have noticed some remarkable variations in their condition. 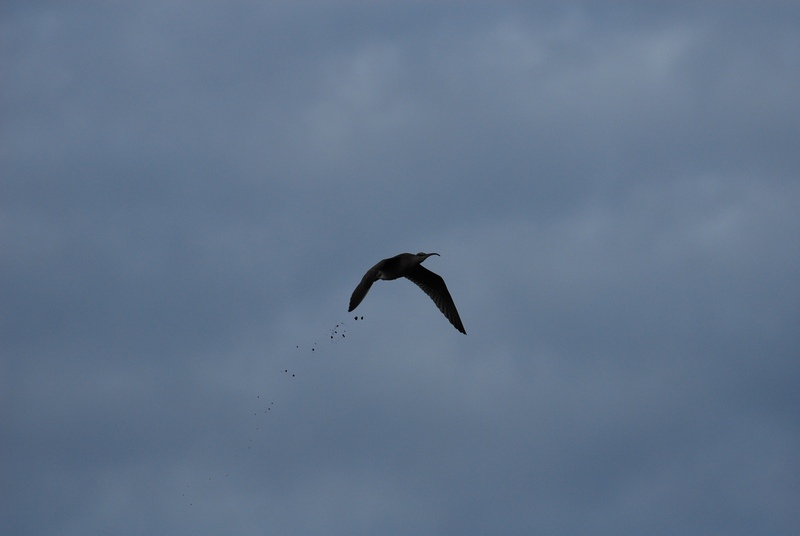 To explain, one of the measurements that we record on all birds caught is the amount of fat they carry, fat score. Blowing to separate the feathers we rate the amount of fat filling their furculum, a hollow at the top of the breast. Fat appears yellow to orangish. 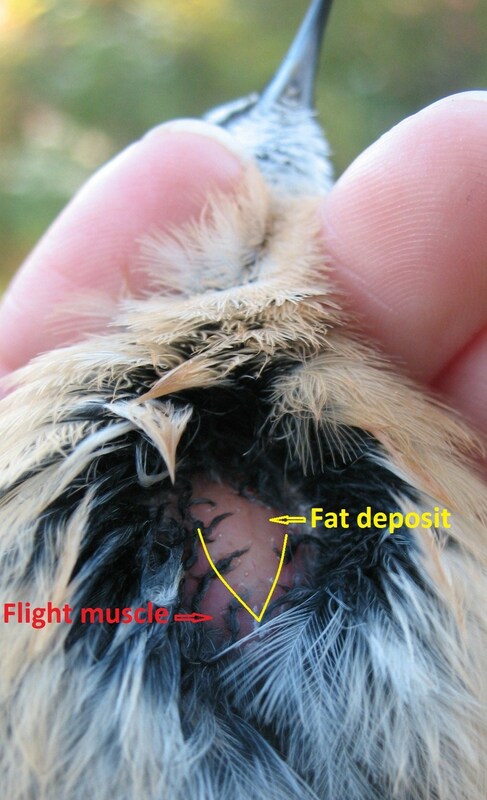 Most birds we have caught have a fat score from 0-1, meaning they have no fat up to fat lining the furculum’s sides. Recently, the majority of BLPWs we catch score from 2-5. A bird with a fat score of 5 has fat bulging from the furculum and pouring over the sides of the breast all the way down covering the abdomen! These birds are carrying up to 25% of their body weight in fat. The reason for so much fat is that they are gearing up for their nonstop flight to South America for the winter. 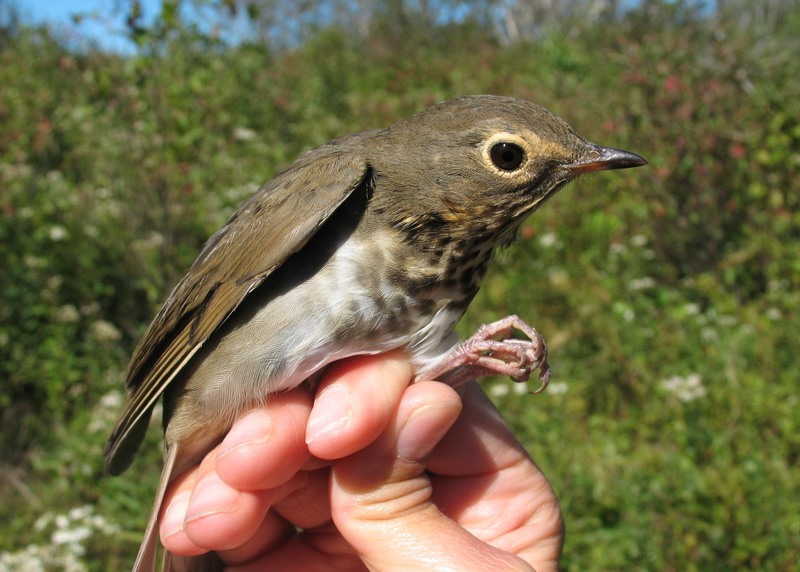 Some of the highlights that we have found in our nets are Gray Cheeked Thrush, Bicknell’s Thrush, Blue-headed Vireo, Rusty Blackbird, and Palm Warblers. We have also been spotting Baltimore Orioles around the house. A Brown Thrasher stopped over at our banding site yesterday, pretty cool bird if you ask me! Cross Island is amidst the northern most portion of their range. 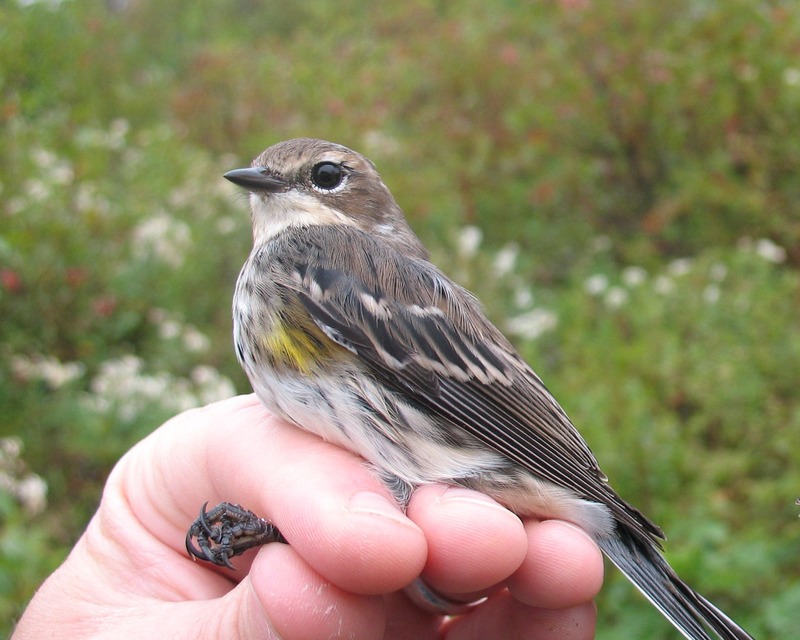 Since our last blog post 6 days ago we’ve seen some ups and downs in the daily capture rate, but things are picking up as more and more Myrtle Warblers move through. Our biggest day of the season thus far was last Friday (Sept. 21), when we processed 78 new birds, 57 of which were Myrtles! 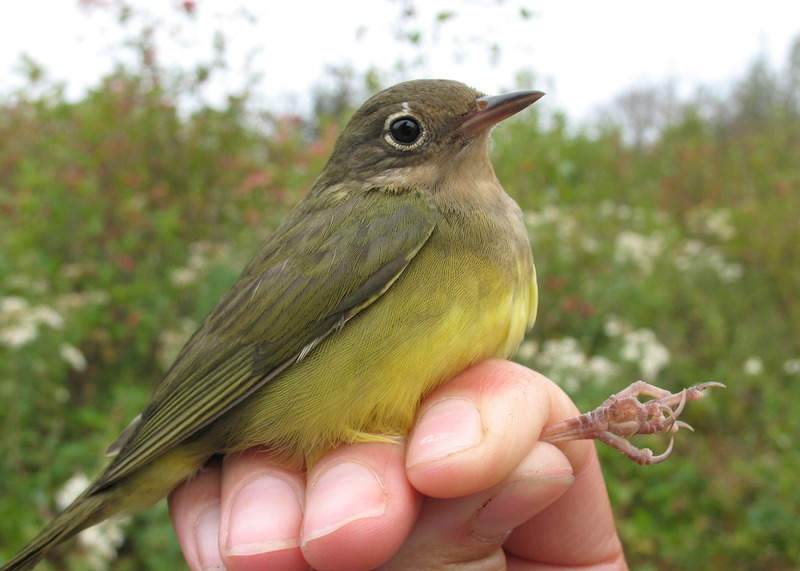 This is a widespread and abundant warbler that breeds in coniferous forests and winters as far north as Massachusetts. 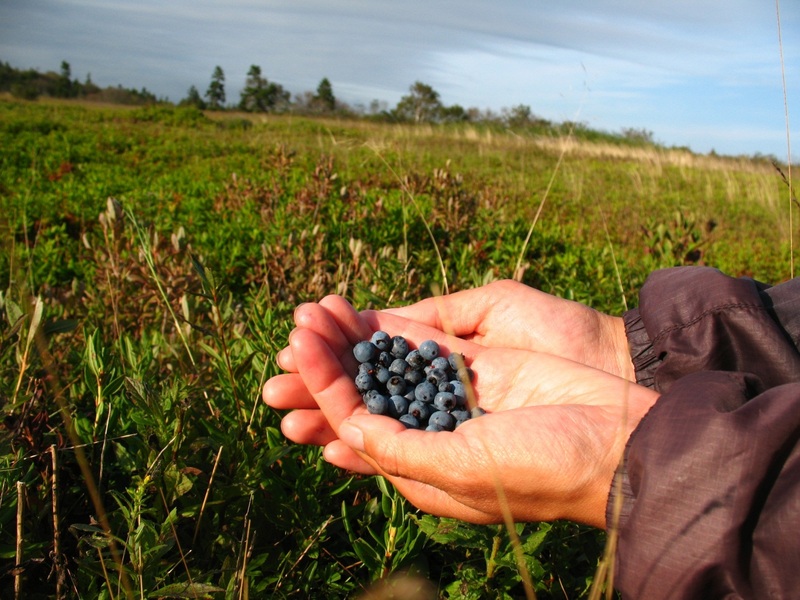 Part of what enables this species to winter at such high latitudes is their ability to digest bayberry and other waxy fruits, though they still enjoy a tasty and nutritious invertebrate when available. 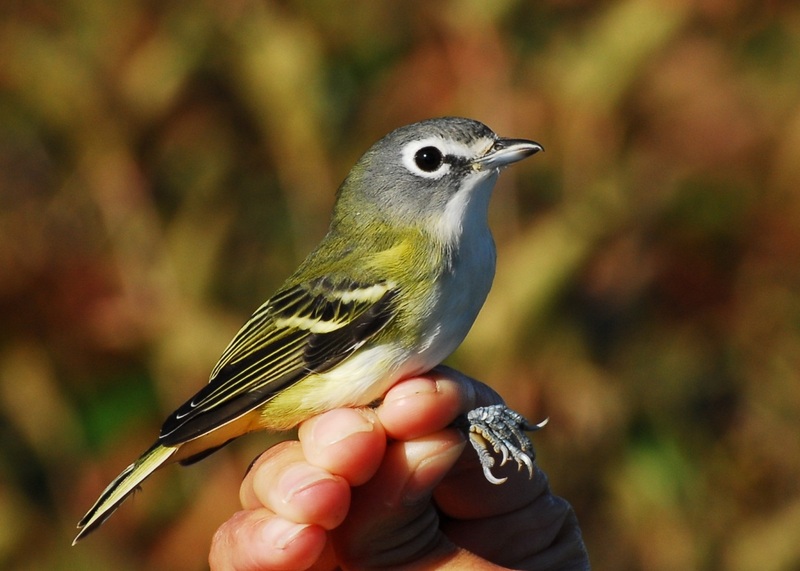 We’ve also seen a moderate swell in vireo numbers over the last few days, with a nice mix of both Red-eyed and Blue-headed Vireo (below) flocking-up with other migrants. Vireos are closely related to Shrikes, and one of the characteristics they both share is a somewhat menacing hooked bill, which aids them when feeding on fruits, invertebrates or (in the case of shrikes), small vertebrates. 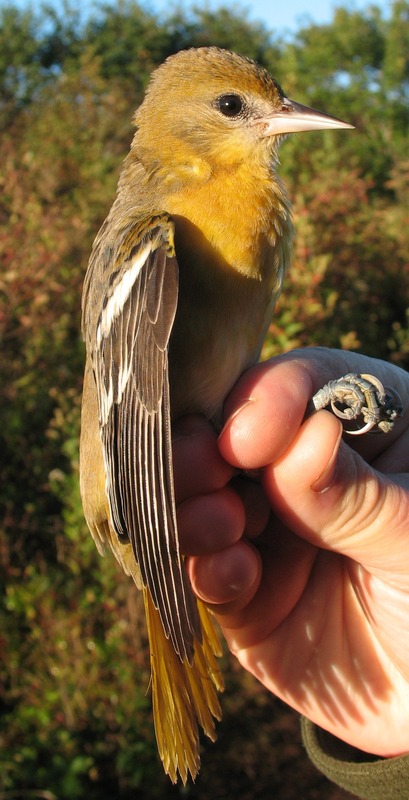 And we finally had our first Baltimore Orioles pass through this week…pictured below is a hatch-year female. 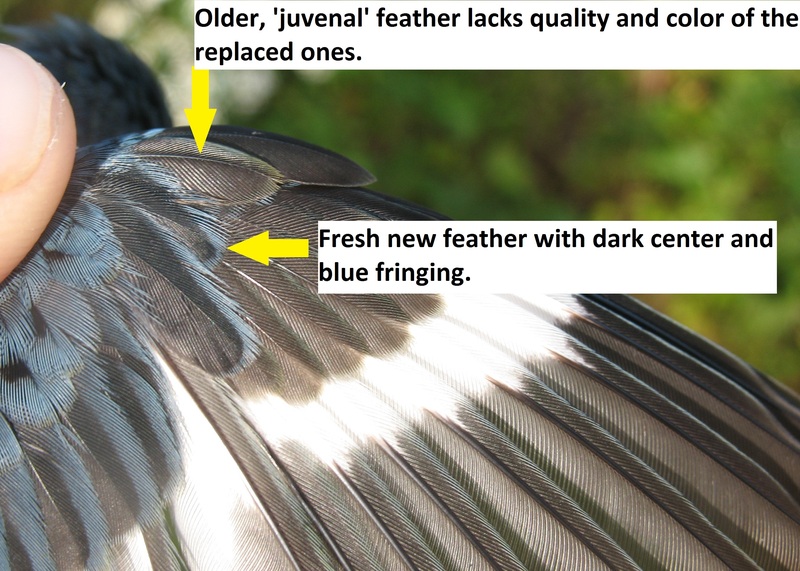 Many passerines show similar patterns of molt, and as with the hatch-year Black-throated Blue Warbler discussed in our September 5 post, this female had a good degree of contrast between older juvenal feathers and newer, recently replaced ones. More often than not, this indicates a young bird, as the adults undergo a complete molt and do not show marked differences in feather aspect. Below is a closer look at the wingspread of this young female oriole. 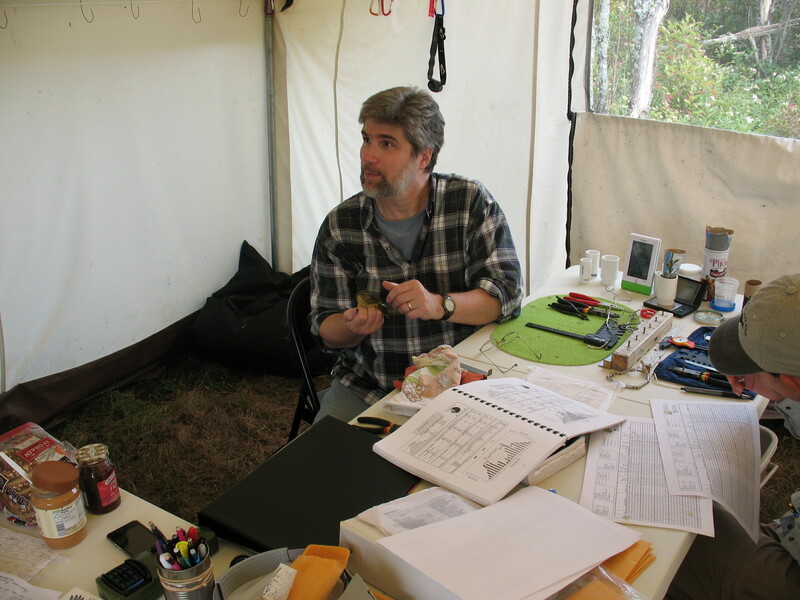 Known as ‘molt-limits’, these differences in feathers allow bird banders to accurately assign individuals to age-classes, and one of the leading figures in understanding this phenomena is Bob Mulvihill (below, with a ‘Yellow’ Palm Warbler). 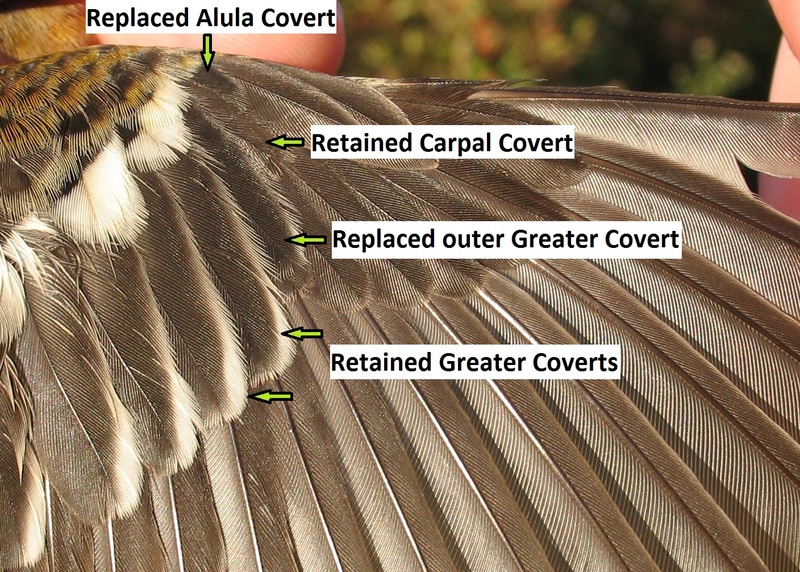 Bob’s yeoman work on molt, as well as a devotion standards rarely matched has equipped a generation of North American banders with the tools necessary to collect accurate, robust data. It goes without saying that we were honored and delighted to have been visited by he and his wife Pam on Saturday (Sept. 22). …and as it likely will be, we are thrilled to welcome Jordan to the crew this week. 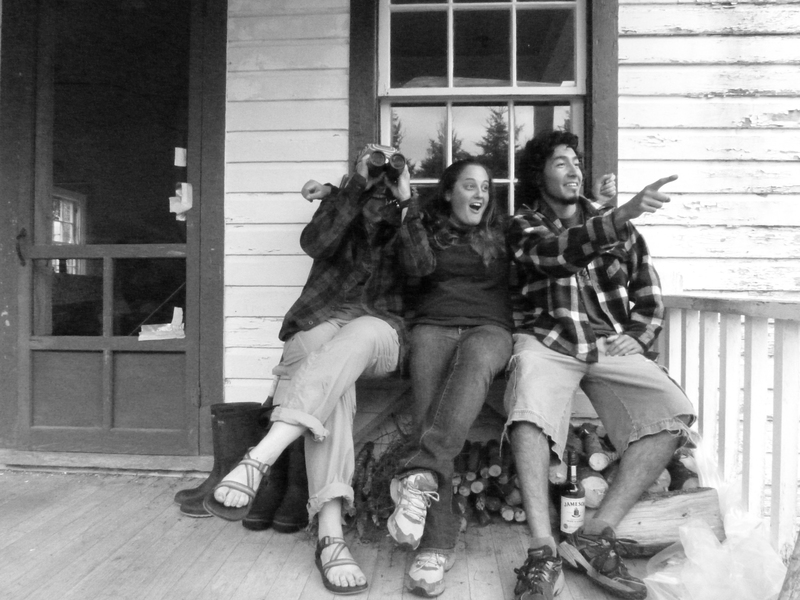 Jordan has worked extensively on refuge islands, playing an integral role in re-establishing and protecting threatened and endangered seabird colonies, among other initiatives. 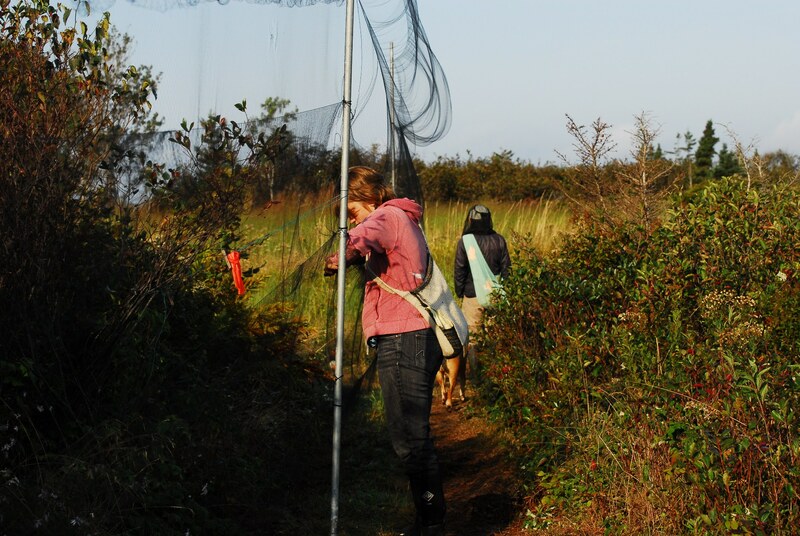 Here she is extracting a Blackpoll Warbler, one of her favorite landbirds. We were also ecstatic to be visited by a rarity for this region. 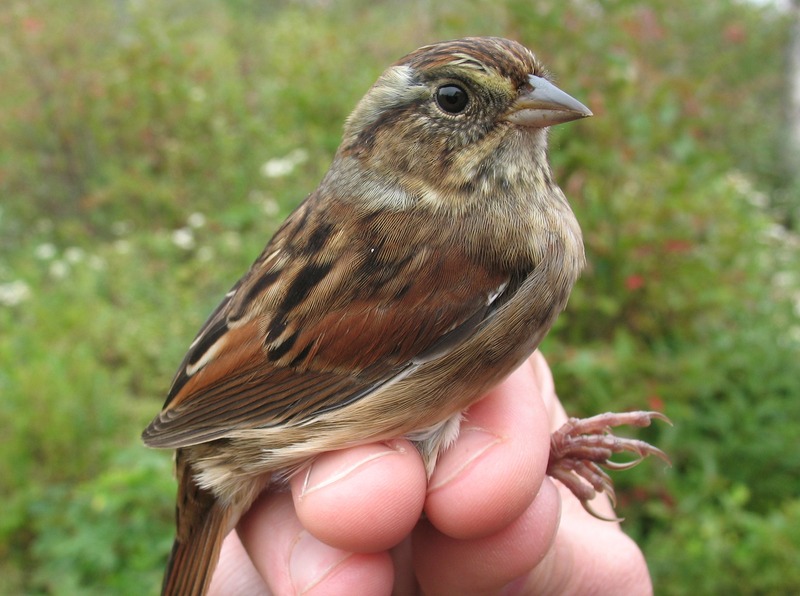 On Sunday (Sept. 16) we processed this hatch-year Clay-colored Sparrow. 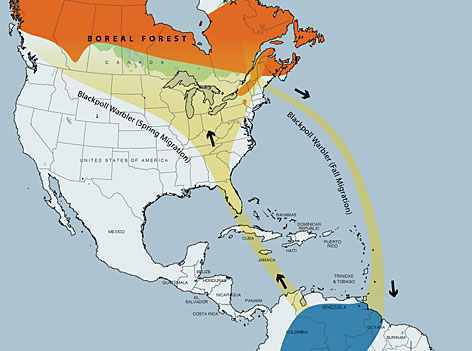 These are birds that breed in the central portion of Canada and the U.S., and are infrequently encountered this far east. 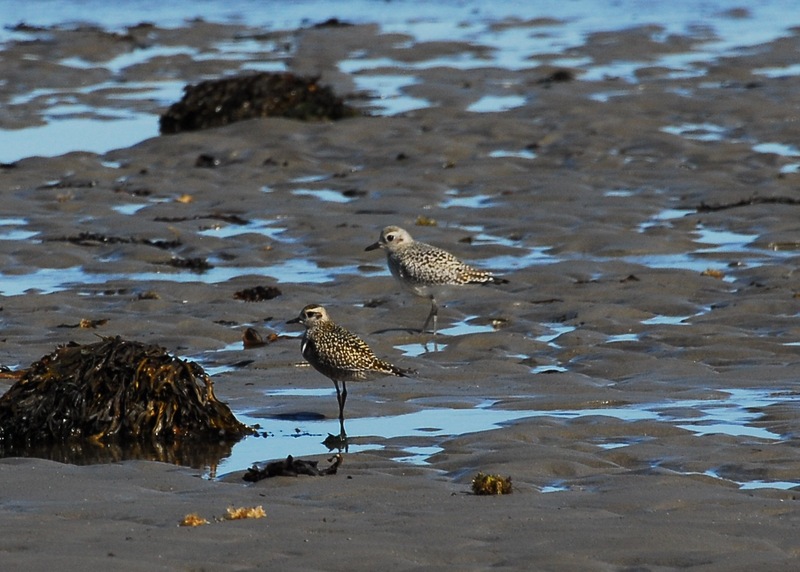 Another rarely encountered species here, albeit of the shorebird variety, was this American Golden-Plover (bottom individual in photo below). 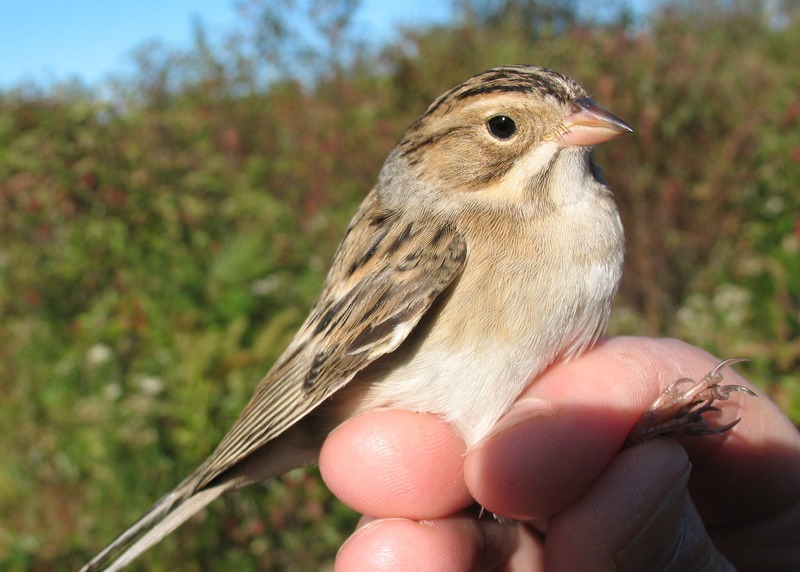 These birds nest in Alaska and northern Canada, and following the breeding season they generally stage in eastern Canada before departing on a nonstop flight of roughly 4000 km to South America. 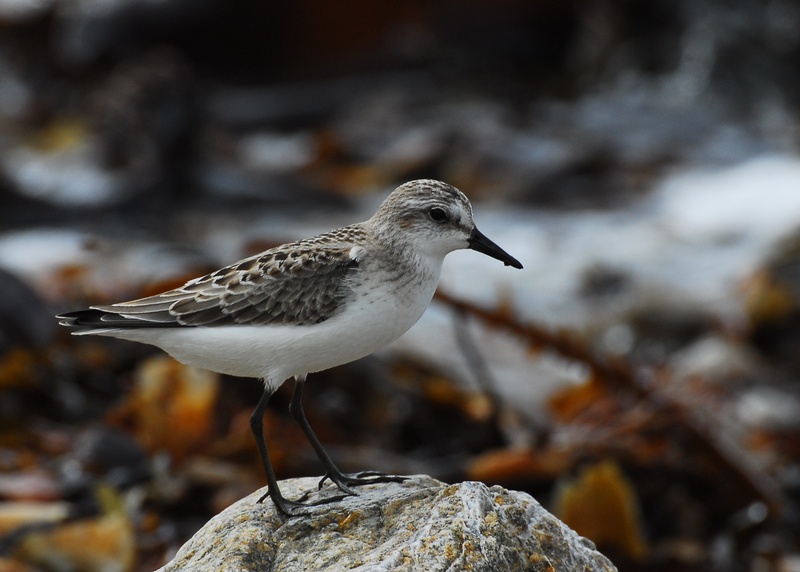 Here it is pictured with the bigger (and more common for this area) Black-bellied Plover. 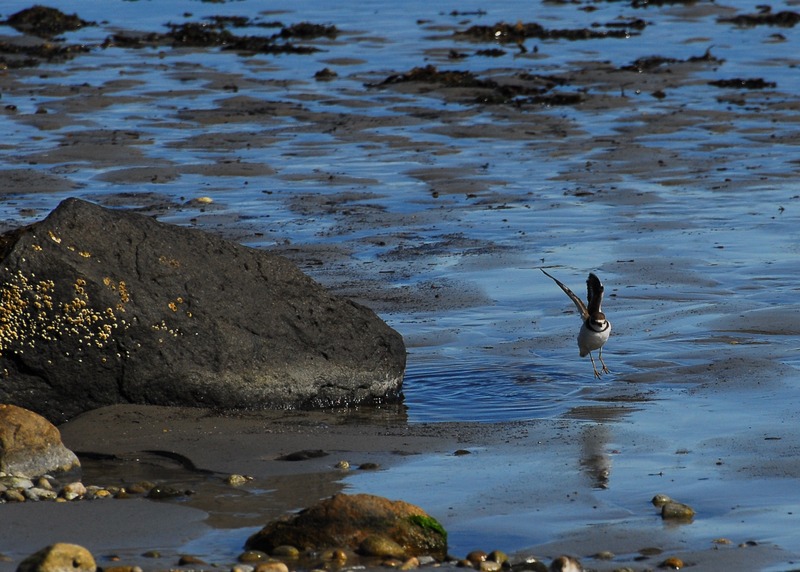 A fairly common shorebird encountered around the refuge during migration is the Semipalmated Plover, pictured here hopping from its saltwater bath. 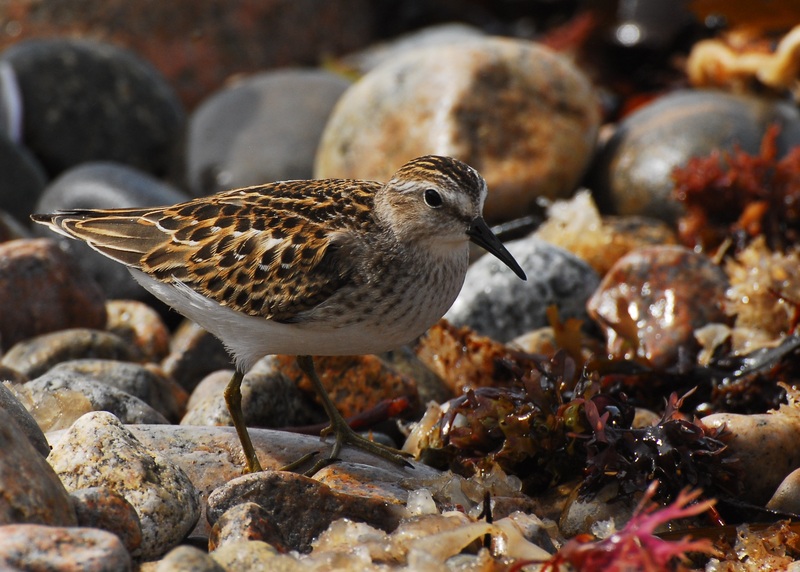 Like the Semipalmated Plover above, the Semipalmated Sandpiper (below) is named for the partial webbing between the middle and outer toes. 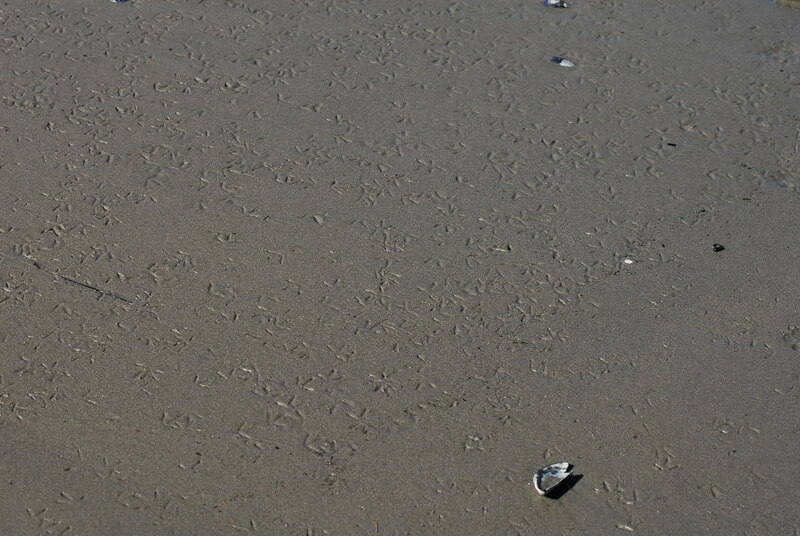 While both species forage along shorelines, and are thus colloquially termed ‘shorebirds’, they are taxonomically assigned to different families. Another common sandpiper around the refuge this time of year is the Least Sandpiper. These birds are fattening-up on abundant invertebrates as they move to their wintering grounds that can be as far south as Chile. 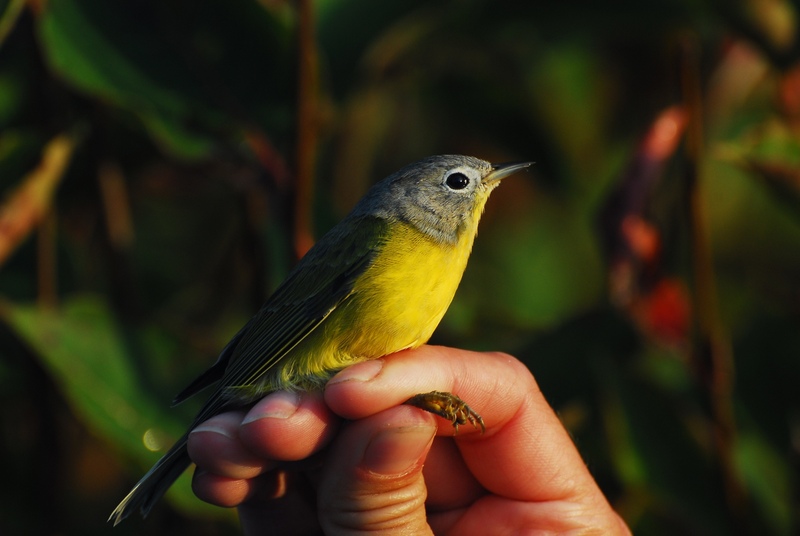 Switching gears back to our landbird friends, the Nashville Warbler has a rather protracted migration, with numbers thinning out by mid-October. 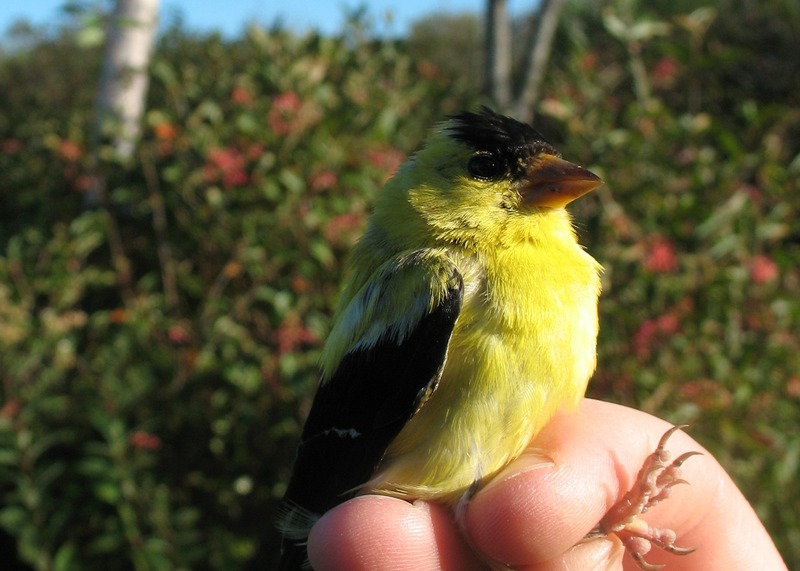 This adult male is most likely on his way to Central America for the winter. Given that he is an adult, he has certainly made this trip at least once before, and hopefully he will have another successful voyage this year. 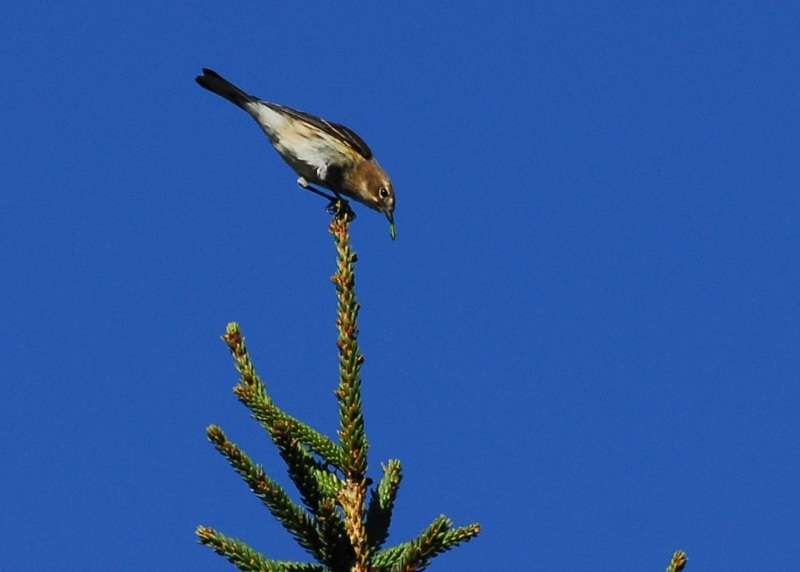 It goes without saying that birds are highly mobile creatures, and during migration this is doubly true. One of the biggest thrills for birders is finding a ‘vagrant’ species – a bird found outside of its normal range. 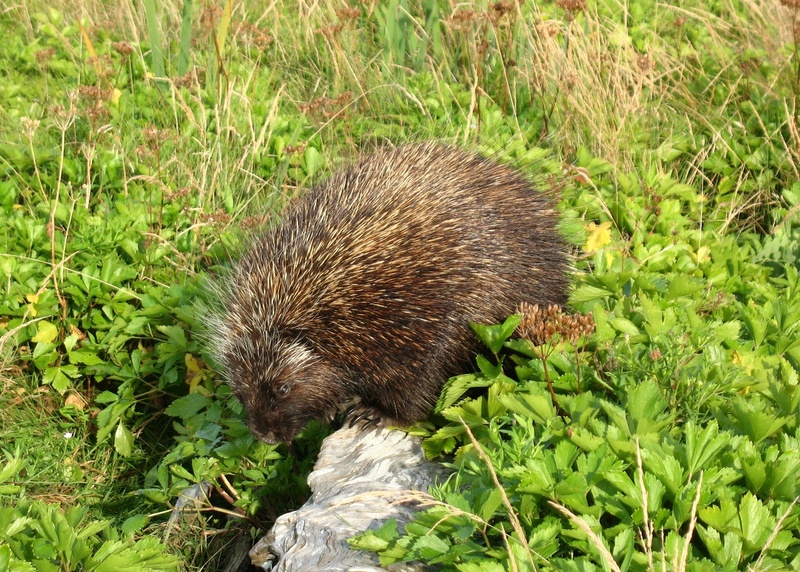 For example, some North American species have shown up in places as unlikely as the United Kingdom, wayward travelers disoriented by storms or inexperience. While perhaps not a true vagrant, this young female Prairie Warbler that was banded yesterday was certainly a surprise for us. 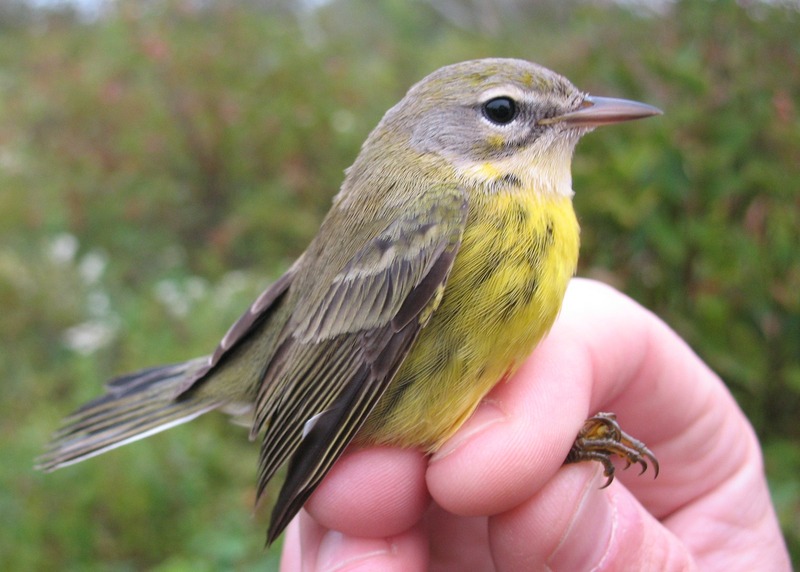 Prairie Warblers are not typically found this far north in Maine, though they are known to breed in the southwest portion of the state. They are a bird of early successional habitats, such as pastures and clear-cuts, and this particular individual may have felt at home foraging in the grassy field near our banding station. This past Thursday (September 13) was an exciting day as well, as we were visited by two Connecticut warblers. These warblers are typically very retiring, and are known to be a hard species for birdwatchers to find. They breed in the boreal region of Canada and portions of northern Minnesota, Wisconsin and Michigan. 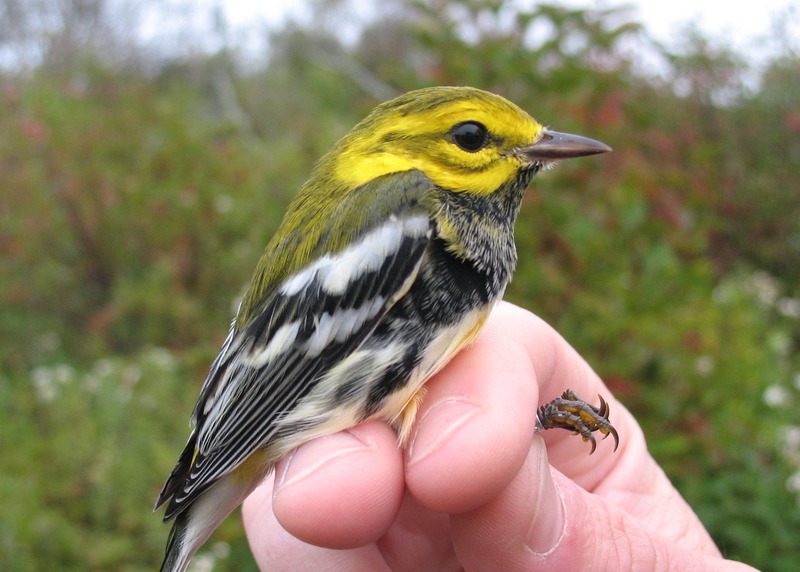 Though their wintering range is not well known, evidence suggests they engage in long transatlantic flights to Amazonian South America, similar to the Blackpoll Warbler we discussed previously. Pictured here is an adult female. Less surprising, but just as delightful, was this sharp-looking hatch-year Swamp Sparrow. In one of our earlier posts we alluded to the fact that birds can often be aged by the appearance of their various feathers. Normally we look at the wing feathers to garner clues as to an individual’s age, but for this species we can also look at the area between the eye and the upper bill (known as the lore). Hopefully you can see some yellowish or buffy tones on this bird, which is characteristic for a young bird at this time of year. Adult lores exhibit more of a steely-gray appearance. And of course, feather color can often tell us what gender an individual is. In the Red-breasted Nuthatches below, the black crown of the male is unmistakable when contrasted with the blue of the female below it. Just as it does for us, color plays a pivotal role in the lives of birds, whether it be for mate attraction, territorial defense or camouflage. There are nearly 10,000 species of birds worldwide, and the myriad plumages found in this incredible group of animals is breathtaking. Pictured below are a Brown Creeper and a Black-throated Green Warbler, representing two extremes in the avian color spectrum. The cryptic plumage of the Brown Creeper helps keep it hidden from potential predators while it creeps along tree trunks in search of food. 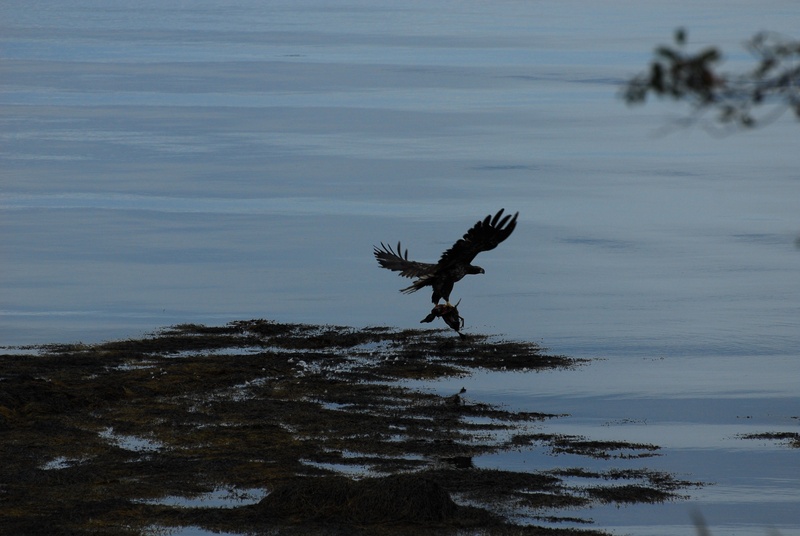 Among the many benefits of working along the Maine Coast is having some great views of Bald Eagles. This was a species that up until 1995 was listed as endangered, so it is always a treat to see them – whether they are simply scavenging fish or making off with a Common Eider. The north winds that we were anticipating in our last post indeed arrived, and with them a moderate influx of migrating birds to our area. Particularly exciting was the arrival of a number of southbound thrush, fairly large birds related to robins. 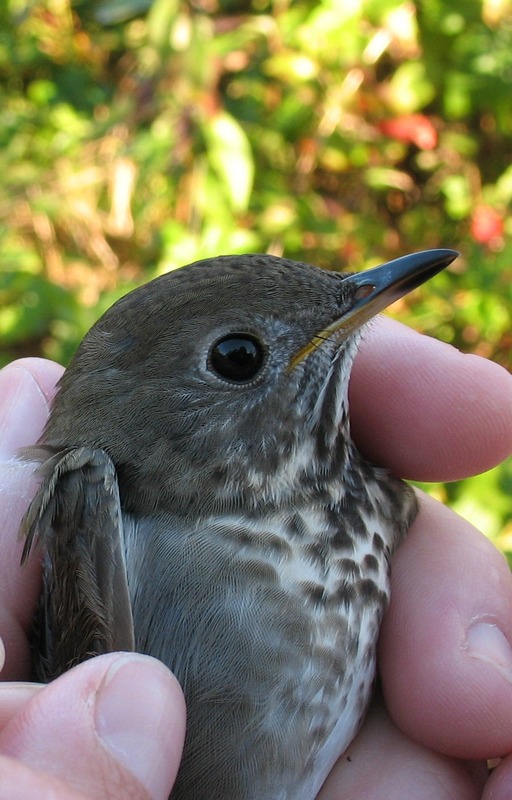 The top photo is a Swainson’s Thrush, and below that is a Gray-cheeked Thrush. Though superficially similar in body shape and plumage, note the warmer, buffy tones on the Swainson’s face relative to the colder, grayer color of the Gray-cheeked. The American Goldfinch is a common backyard bird, and if you’ve kept feeders you’ve likely had some good views of these beautiful birds. This male is currently molting out of his bright yellow breeding plumage and will soon be sporting a more subdued, grayish look. 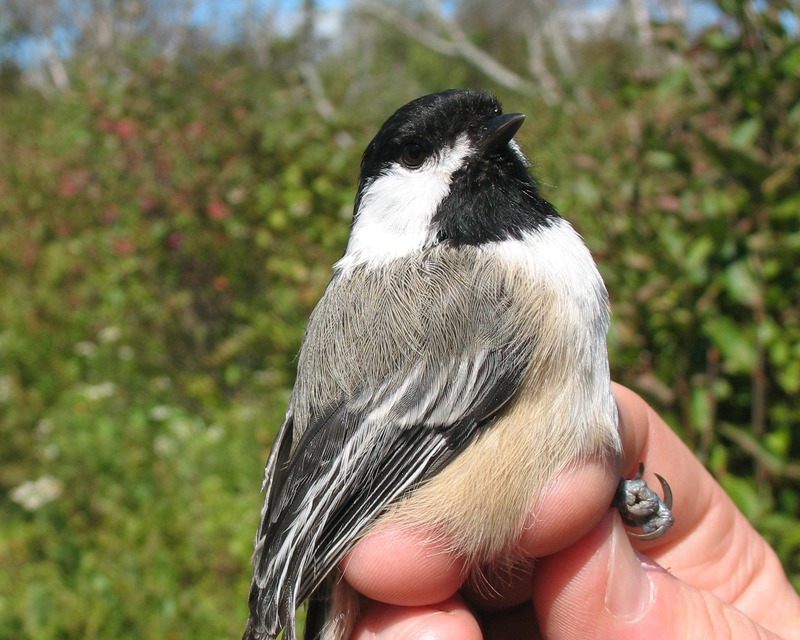 Another common backyard bird, particularly at winter feeding stations, is the Black-capped Chickadee. These hardy little birds remain at some pretty high latitudes during winter, and can survive some incredibly harsh conditions. One of the ways they stay warm through cold winter nights is by huddling together in tree cavities. 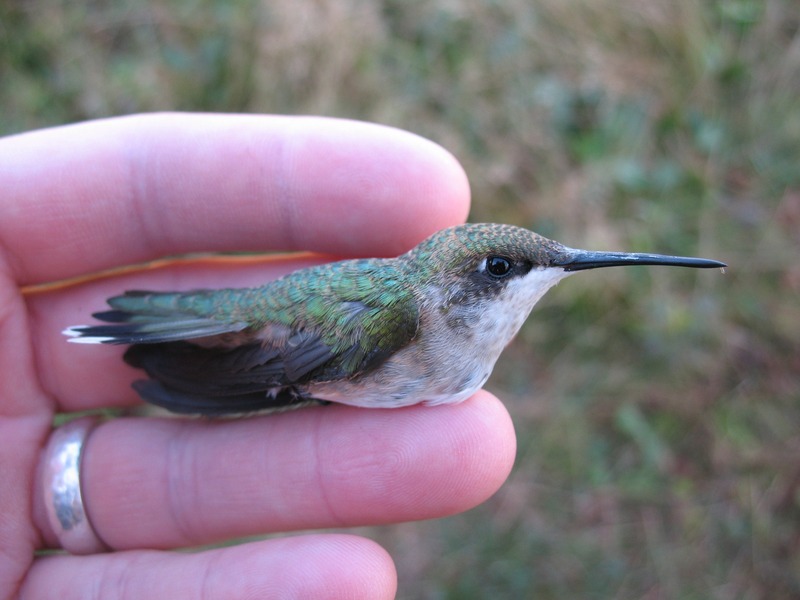 A bird that cannot survive cold northern winters is the Ruby-throated Hummingbird, and this little female (who weighed 3.4 grams) is on her way to the tropics. It is hard to believe that some individuals of this species will fly across the Gulf of Mexico on their annual migration, a trip covering over 500 miles of open water! As we discussed previously, birds engaging in these marathon flights put on large reserves of fat, and we have seen some hummingbirds nearly double their bodyweight before heading south. 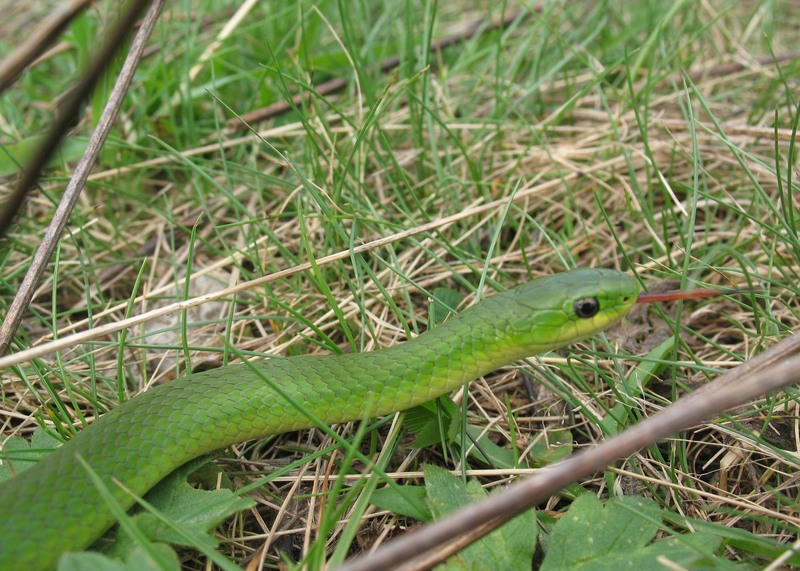 Not all of our encounters are of the avian variety, and we sometimes have to watch our step around the banding station so as not to disturb these graceful smooth-green snakes. They blend in well with their surroundings as you can see, and eat mainly spiders and insects. 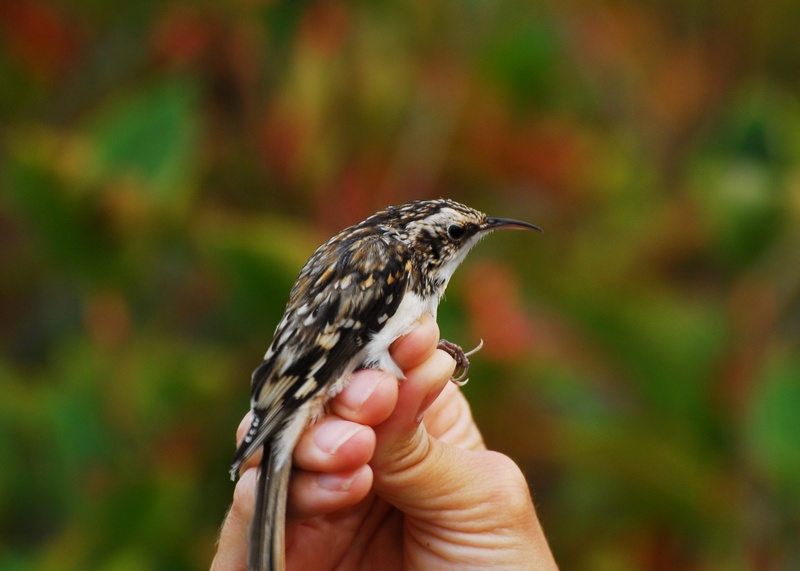 Thus far we have caught over 800 individual birds of 40 different species. Migration numbers typically peak here during mid-September through early October, so we expect our daily volume to increase dramatically in the upcoming days. 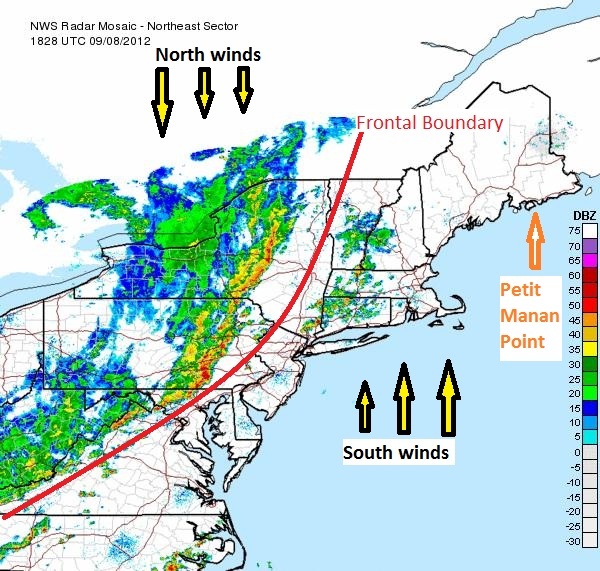 No doubt you can make out the turbulent area in this image, but what isn’t visible in this frame and what follows the frontal boundary are northern winds – perfect if you are a bird in need of a ‘push’ to the south! Hopefully this will translate in to some new arrivals over the next few days, as the front passes over us. See http://virtual.clemson.edu/groups/birdrad/COMMENT.HTM for a more thorough treatment of radar ornithology. Very interesting stuff! In our previous post we discussed the amazing distances some birds cover during migration, which begs the question, just how do they do it? In large part (aside from favorable weather conditions) it comes down to burning fat. Birds moving great distances will become ‘hyperphagic’, which means they will eat like a superbowl fan on Sunday! But instead of sleeping off the largesse of calories on the couch, they utilize that energy to power their epic flights south. 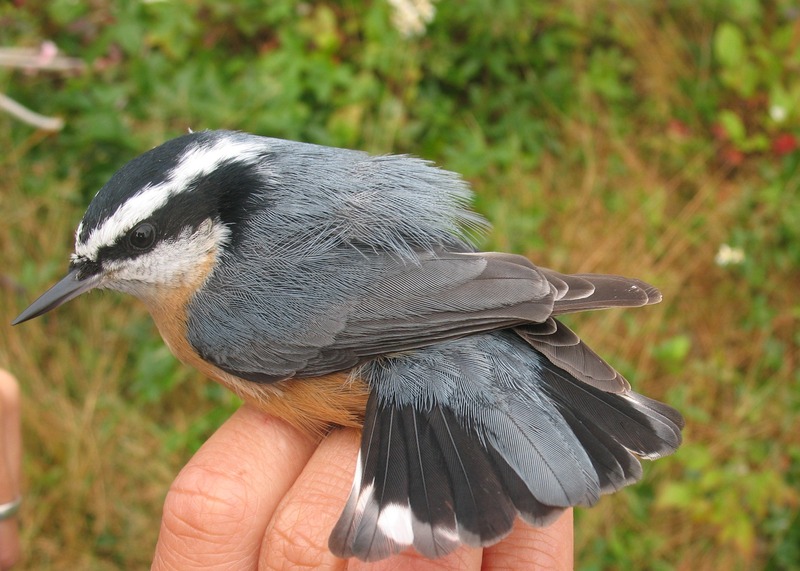 Here is a photo of a Red-breasted Nuthatch with a deposit of fat in the furcular hollow (basically the space between the collar bones on you and I). Hopefully you can see the contrast between the red flight muscles surrounding the yellow fat deposit. 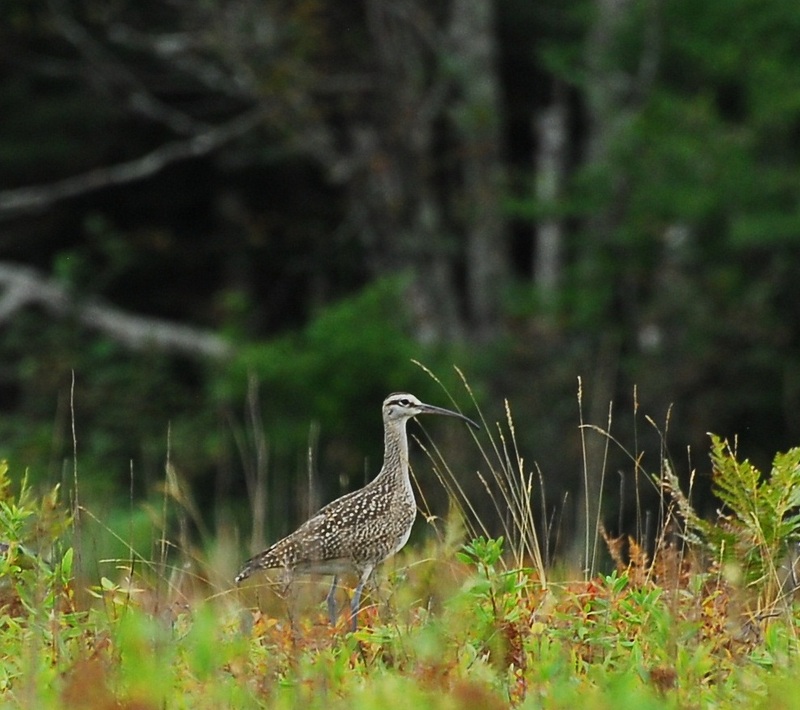 Finding abundant resources are a migrating bird’s stock-in-trade, and here at the refuge we are fortunate to have a large crop of blueberries at their peak, which a number of staging Whimbrels have been fattening-up on. Whimbrels are a large shorebird whose winter range includes both coasts from the southern U.S down through South America. Incredibly, this species has recently been found to successfully navigate their way through tropical storms and even hurricanes during their southbound flights over the Atlantic. Though we do not band these birds, we still maintain records of their presence as a corollary to the banding effort. We never take for granted our beautiful surroundings. 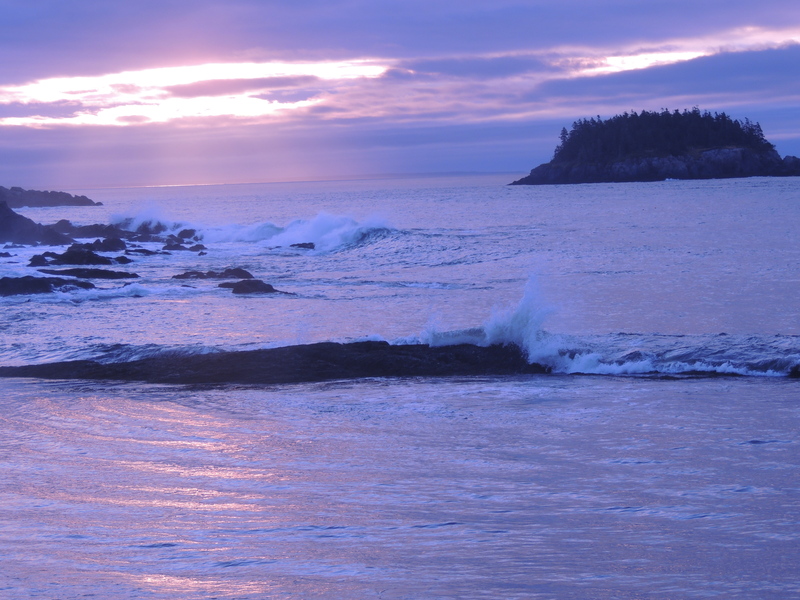 Petit Manan Point is part of the Maine Coastal Islands National Wildlife Refuge complex that includes more than 8,000 acres of coastline and offshore islands. 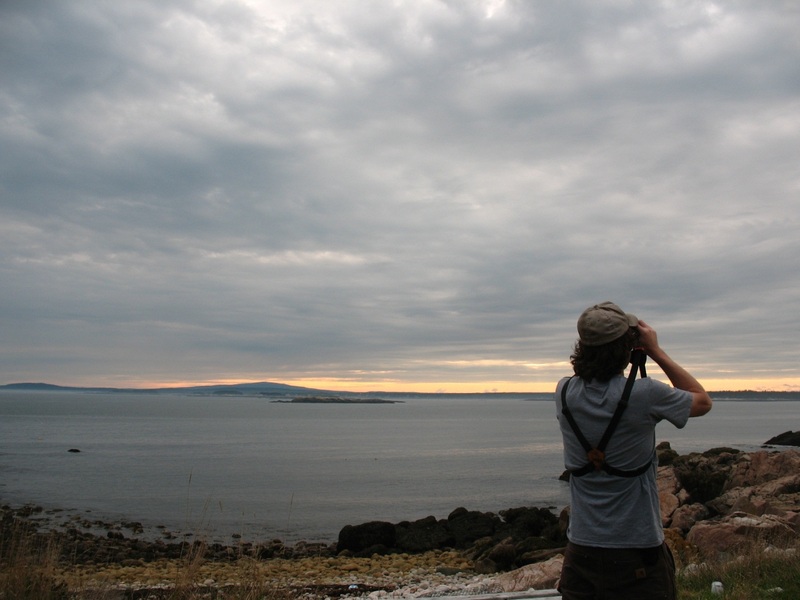 Here Jeff samples a portion of this incredible area while scouting for Northern Gannets. Any day you find yourself working with birds is a good day, and what we learn from the birds we band can really help put life in perspective. 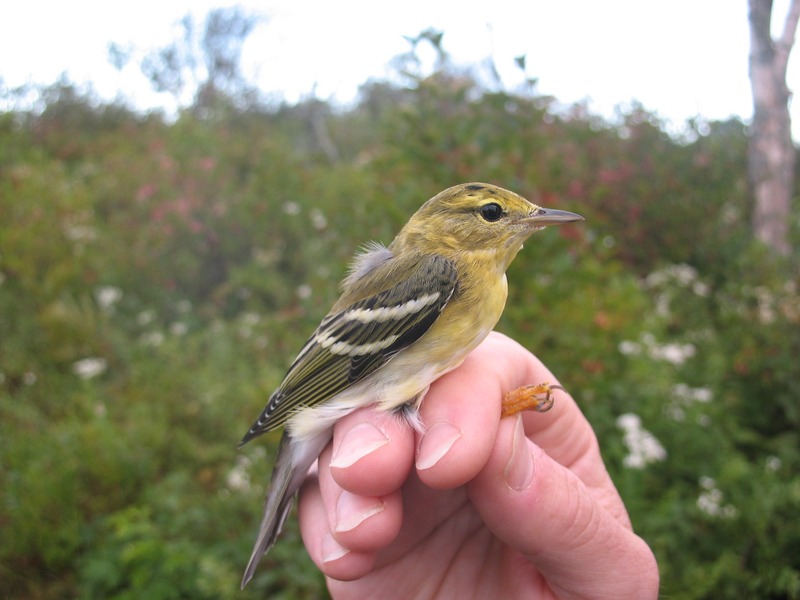 Pictured below is the third Blackpoll Warbler we have banded thus far, and it is a particularly notable wood-warbler in that it engages in a mammoth fall migration that can find individuals traversing the open Atlantic on their way to South American wintering grounds. Keep in mind these are songbirds, and are unable to alight on the open ocean for a rest as are waterfowl, so they must travel nonstop on a flight that can be up to 3000 kilometres long. This has been likened to a human running 4-minute miles for 80 hours! The challenges these little songbirds surmount in their annual life-cycle are truly mind-boggling. 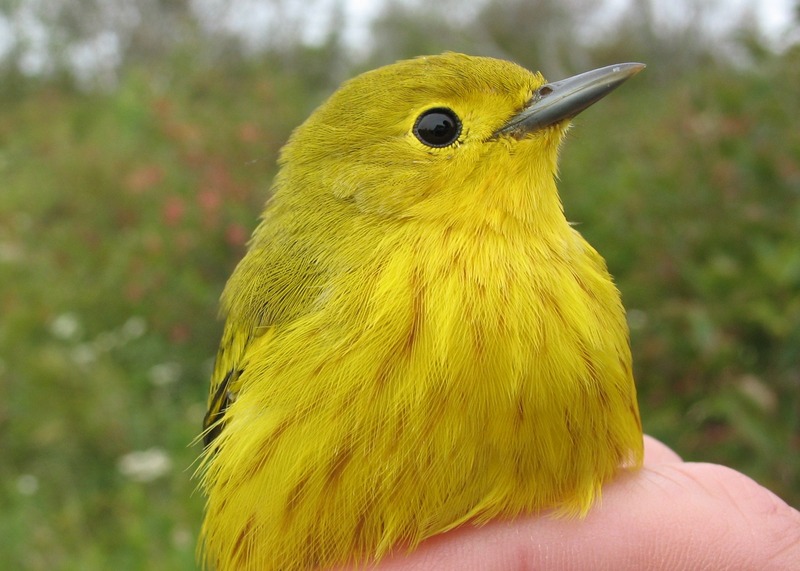 The aptly named Yellow Warbler is an early fall migrant, with movement to the south typically peaking in early August, so we were pleasantly surprised to find this adult male in our nets on September 3rd. 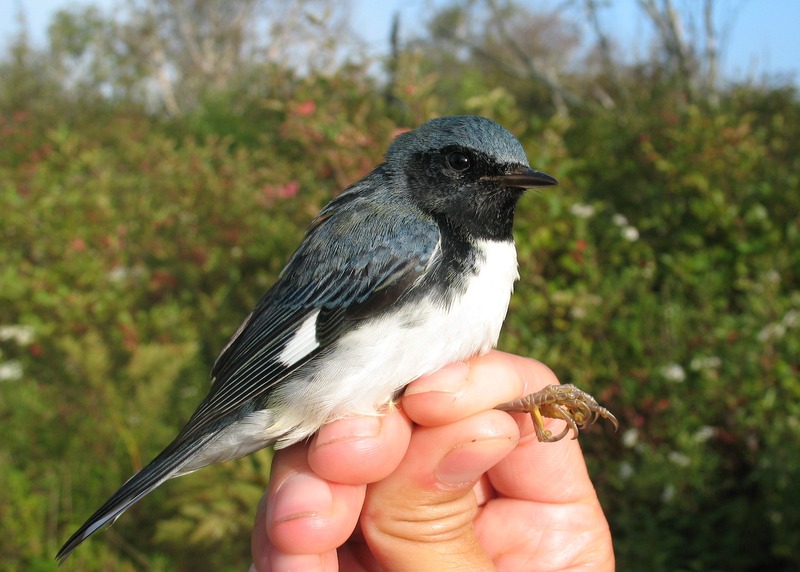 Another warbler whose name needs no explanation is the Black-throated Blue Warbler. These gems of the eastern forests are on their way to the Bahamas and Greater Antilles for the winter. Pictured here is a young male who hatched-out from an egg this past summer. We can tell he is a young bird due to the differences in the wing feathers denoted below. Adult birds will show no difference between these feathers since they undergo a more extensive molt than their hatch-year counterparts. 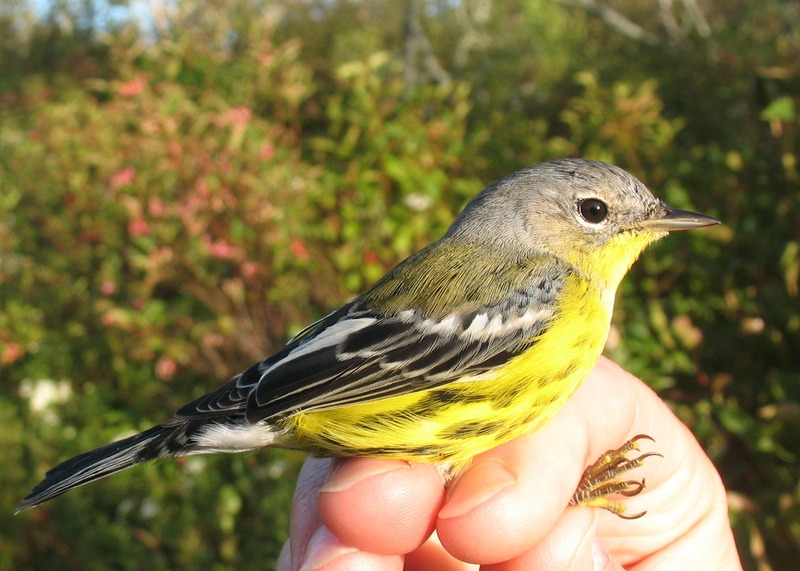 A warbler whose name does require some explanation is the Magnolia Warbler. These birds typically nest in dense coniferous forests, not magnolias, but the first specimen was collected from a magnolia tree and the name has remained. Pictured below is a male in non-breeding or ‘basic’ plumage. We would be remiss if we did not include a photo of a very common denizen here at the refuge…we have seen quite a number of different individuals, typically out foraging at dawn and dusk. 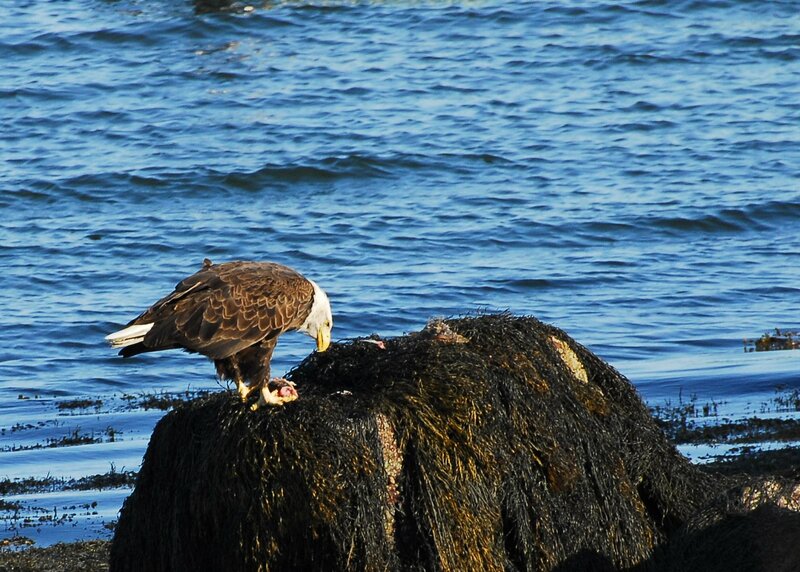 This large individual was spotted toward the south end of the point, and was given a wide berth!